This free event is open to the public but please register as class is limited to 8 people. Check our calendar for optional dates and times. Wondering what Letterpress is? 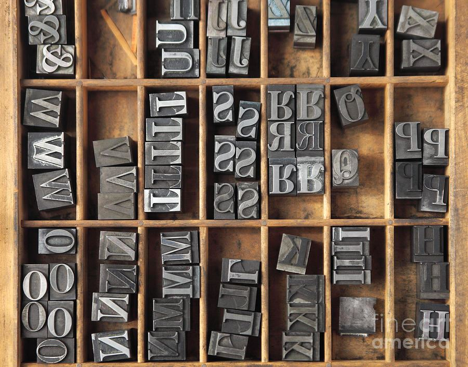 Whether you are a beginner or an experienced letterpress printer, drop in any time between 4:00 PM and 6:30 PM during this monitored studio session to become acquainted with BARN’s Letterpress Studio — its equipment, tools and resources. Join us for one or more sessions to get your questions answered and talk letterpress. Please see our calendar for other dates and times. Hidde Van Duym is a Founding Member of BARN and is a member of the Book-Arts/Letterpress Steering Committee. He is a book-arts artist whose work has been shown at Bainbridge Arts & Crafts, Roby King Gallery, Craft in America, and the Artist's Books Collection at the Bainbridge Island Museum of Art. He regards the letterpress as an opportunity to expand his book-arts horizons. Peggy Graving is a member of the steering committees at the BARN for the Book Arts/Letterpress Studio and the Printmaking Studio. Her letterpress knowledge and skills have been developed in multiple BARN courses taught by Ellie Mathews and Carl Youngmann of The North Press in Port Townsend. If you are a Non-Member (or a Member who has forgotten your fob), please park behind BARN on the lower level. There will be a Studio Doorbell to ring and someone will let you in.